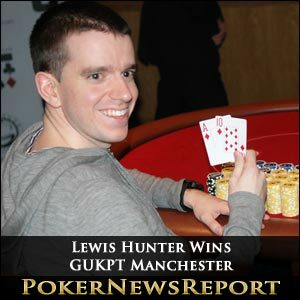 Scotsman Lewis Hunter has crossed the border with England to complete a successful raid after taking home £49,600 for winning the first leg of this year’s Grosvenor United Kingdom Poker Tour (GUKPT) in Manchester. The West Lothian player outlasted 170 other entrants in the first major tournament of the year in Britain to take the £1,070 buy-in main event title by defeating online sensation Kevin ‘kevsteele’ Steele in their heads-up battle that left the Englishman with £34,630 for his runner-up finish. Hunter has already stolen a march on every other player looking to compete during this sixth staging of the GUKPT in the chase for the £40,000 that is up for grabs for the tour’s Leaderboard winner. The eventual winner will also be handed a year of buy-ins to GUKPT events, as well as accommodation for each tournament. Hunter was, of course, delighted with his victory, saying he was feeling “very good” following his heads-up success – especially as the “trophy is going back to Scotland!” The 24-year-old was, however, disappointed that he “lost a lot of bluffing”, but was still delighted to have succeeded against two-time PokerStars Sunday Million winner Steele when he got “the best of him at the end”. Steele’s heads-up appearance certainly should come as no shock, though, after a stunning 2011 at the virtual felt, which included his double Sunday Million joy inside four months last year. Steele outlasted a 6,182-strong field in July to collect $128,792 after a five-way deal was struck, before adding $168,838 in November, when this time he agreed a four-player deal during an event that attracted an even larger starting line-up of 6,967. The Englishman was certainly happy with his runner-up spot in Manchester, saying “it was good fun…not a bad start to 2012”, although he did have regrets as he was just “one card away” from collecting the title. Ultimately, though, he reckons this high finish can lead to better things in 2012, so Steele is already preparing to “play a few more of these” GUKPT events. He began his clash with Hunter with a 2 to 1 chip lead, but couldn’t stave off the Scot’s charge to glory. Steele had been forced to battle back from only 25,000 chips at one point before seeing his aces and kings hold to take him into a position where he felt comfortable pushing Hunter all-in for the Scot’s tournament life. Hunter, with K-J, was left drawing to just a handful of outs when Steele’s dominated K-10 caught a fortunate flop of 10-9-4 for top pair. However, the Scot himself got lucky when a queen arrived on the river to hand him a straight and big chip lead over Steele. But Steele wasn’t done yet and fought back to pull level in chips with Hunter, only for the Scot to then turn up the heat on his opponent over the next 30 minutes. Hunter finally got Steele all-in following an ace-high board for his victory. Before the hand was completed, however, both players had checked the flop, although that all changed when a king arrived on the turn. Steele and chip leader Hunter were all-in as the former showed A-9 to be hugely dominated by the Scot’s A-10. With the river coming as a blank, that was it and the young Scot was crowned champion of the 2012 GUKPT opening event. Armadale’s Hunter had recorded his biggest previous cash, for £4,130, back in August of last year with third in the £300 buy-in No-Limit Hold’em on the Edinburgh stop of the United Kingdom and Ireland Poker Tour (UKIPT). But this victory – his first major triumph since managing four cash finishes at last summer’s World Series of Poker (WSOP) – at the three-day tournament held in Manchester’s G Casino is undoubtedly his best finish yet. Hunter might not have pocketed the £58,100 that Peter McCarthy left last year’s main event with for his victory – with the 2012 event falling 36 players short of the 207 that signed up in 2011 – but the Scot will be delighted to have taken home the lion’s share of the £171,000 prize pool. Hunter had to face-off with two-time Sunday Million winner Steele come their heads-up clash, but survived a rollercoaster ride, including a succession of all-ins, over the three days that eventually saw him eliminate his English opponent to secure the title and trophy. A total of 17 places were paid, with London’s Chun Law picking up the first cash prize of £2,140. However, some of the better-known pros that arrived in Manchester failed to make the money, including Matt Perrins, Jake Cody, Julian Gardner, John Eames, Will Fry, Stuart Fox, Andy Peters, Simon Deadman, Sam Macdonald and Rick Trigg, although Ian Nelson finished in 11th for £2,560 and Matt Perry took 16th for £2,140. Sunny Chattha and Karl Mahrenholz – who are both members of the Hitsquad, a five-strong London-based group of poker pros – also failed to follow up previous GUKPT wins with success in Manchester. Chattha picked up £88,150 for winning in Walsall back in February of 2009, while Mahrenholz collected £38,700 after taking down the Cardiff event seven months later. Many of the unfancied online and live qualifiers enjoyed successful tournaments, with third-placed Allan Doyle the best of those competitors after taking home £21,800 for just a £75 entry. The local player could hardly believe his good fortune as he easily surpassed his biggest previous live cash of only £520 for his seventh place at 2010’s Manchester stop from the £100 buy-in No-Limit Hold’em event – and all on his birthday, too! The nine-handed final table saw John Hanley (£4,700) and Chris Kadji (£3,420) exiting on the same hand in eighth and ninth respectively to fellow Englishman Gary Holden. Next to leave the table was Gonzalez Garcia when his A-J lost out to the pocket queens of Day 2 chip leader Sam Grafton after the Argentinian had shoved all-in. Garcia left with £6,410 in seventh place. Leamington Spa player Grafton might have collected Garcia’s chips with that hand, but he was soon hitting the rail himself in fifth place for £10,260. But, before then, another Englishman, Gary Holden, finished up in sixth place for an £8,120 pay day after his short stack lost out to London’s Danny Blair in a blind-on-blind clash. Then, just after the start of the next level, Doyle doubled-up through Grafton, who then moved all-in pre-flop for more than 500,000 chips with Q-J, only to be called by Hunter. The Scotsman showed A-9 to remain ahead and eliminate Grafton, who had at one point possessed about one-third of the total chips in play. Blair exited in fourth place for £13,250 when his up-and-down day ended after his stack was snaffled by Steele in two massive hands. Blair lost a gigantic pre-flop race first of all, then was met by Steele’s dominant ace in the next to see him record the best live performance of his career from the handful of final tables he has made during the last 12 months. There are 11 more stops on the GUKPT this year, with the next destination being the Grosvenor Casino in Walsall from March 11 to 19, which will include numerous qualifying tournaments for the £1,070 buy-in No-Limit Hold’em main event. The main event runs from three days from the 16th to the 18th and will see entrants start with 20,000 chips for one-hour blind levels.